The other day I saw this article about Utah's government requiring beer to be a ridiculously low 3.2% ABV to be sold at convenience/grocery stores to the point that the government was testing anything that was going to the stores. Sure, liquor stores could get something like Big Bad Baptist, but a local grocery store/convenience store wouldn't be able to. 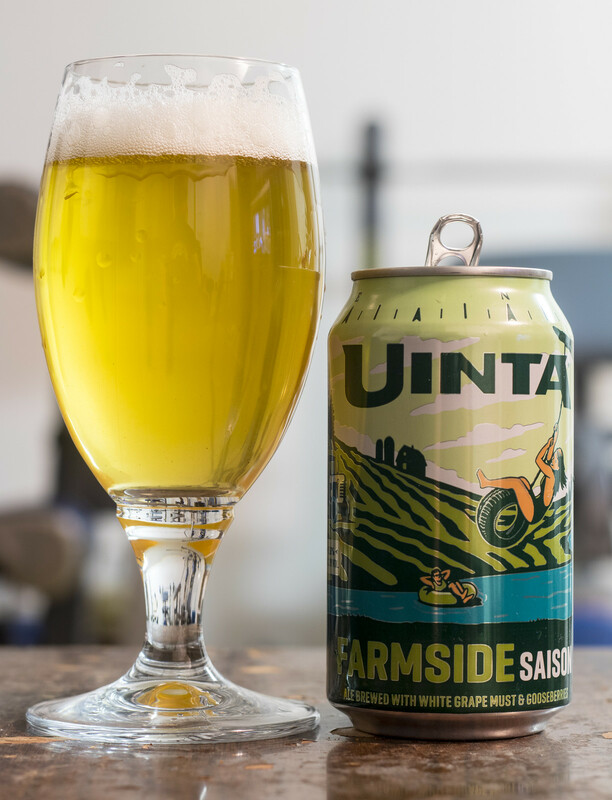 Salt Lake City's Uinta Brewing's Farmside Saison is described as boasting funk & fruit notes from white wine must and gooseberries, this earthy saison is approachable yet complex. Appearance: Farmside pours a fairly clear yellow straw body with a light cloudiness to it, reminiscent to an unfiltered pilsner. There's carbonation in the body that's reminiscent of your typical pils/lager, and the head is just like that.. it's a light white sprinkling of foam here and there. Aroma: I'm starting to think that this beer was packaged wrong.. the can says Uinta Farmside Saison, but it has an aroma that's more reminiscent to a typical craft pilsner... what's going on?! So, I took a look at the ratings at RateBeer/BeerAdvocate and it turns out that neither my senses or the beer was lying to me. This beer has a crisp, grainy profile that you see in your typical craft pilsner, followed by a moderate amount of lemongrass to it. As I let the beer warm up a bit, I get a bit of a white wine presence to it, and slight notes of clove and banana. Taste: This time around, I didn't feel like I was drinking a pilsner out of a saison can, rather - it tasted like a bit of a white wine meets a pilsner - there was a good white wine presence to it that I don't typically see in craft beer, it was sweet, a bit tart, but fairly dry. The other side of this beer seemed like more like a craft pilsner than a saison.. the only thing that seemed like possibly being a saison last time around was that there was a slight clove/banana presence to it. This beer has a crisp & grainy barley presence with a tad bit of sweetness to it.. but this doesn't remind me of ANY saison/farmhouse ale I've had in the past 9 years. There's a mild citrusness to it that gives off a light tartness and a good deal of lemon.. but this all in all reminds me of amazing pilsners more than any saison I've ever had. Overall Thoughts: Great tasting pilsner with notes of banana/clove and white wine, but I don't think this is a saison at all. I'm not a BJCP-certified judge, so I'm not one to judge.